Not every floor is suitable for dancing and therefore, you need to have dedicated dance floors when you are inviting guests for partying. Besides, if you are a dancer by hobby and want to take it professionally, you need to have space at your home for practicing. A portable dance floor is a perfect option for all scenarios, and you can put them together anywhere you want like indoors or outdoors. They are tailor-made for dancing with better grip and durability. Check out the top 10 best portable dance floors in 2019 below. This is a set of 26 tiles, and it covers 26 square feet of area. Therefore, you will get ample space for dancing. There are beautiful textures available to choose from, and they are easy to install and relocate. The surface has the vinyl material, and there are raised plastic tiles for better grip of the floor while dancing. There are also click border and corner edge components available. 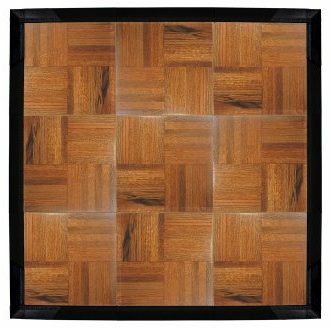 It is one of the most beautiful and economical portable dance floor tiles. Made of hard PVC plastic, this 8’X4’ dance floor covers the area of 32 square feet. 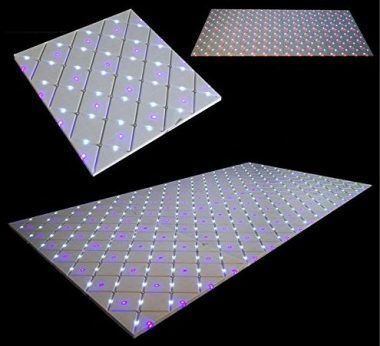 Each square of the floor consists of 32 LED lights. These lights come in red, purple and orange color. The dance floor includes a 110-Volt power adaptor. This floor is sturdy enough to dance hard on it. The dance floor is easily transportable and cleanable. 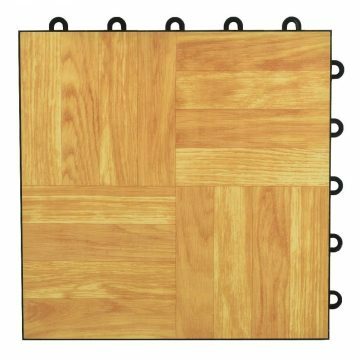 You get total 8 pieces of 24”wide X24” long dance floors. This dance floor looks good at proms, birthday parties, fashion shows, and likewise. Manufactured in the USA, the portable dance floor comes in 26 pieces of 1X1-foot size with 5/8-inch of thickness. 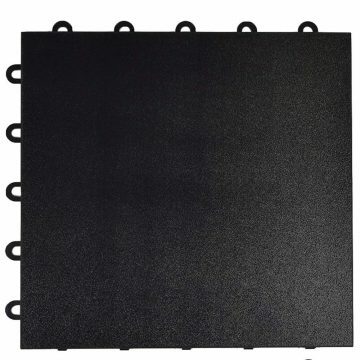 The industrial-grade black vinyl layer of the dance floor makes it durable. These pieces of dance floor can cover the area of 26-square feet. With the easy snap together the design of these tiles, support simple installation every time. The tight fitting of these tiles allows water and air circulation under the floor. You can get optional black ramped border edging with the dance floor. These tiles are resistant to water. Constructed with premium quality woods, you get two color options on oak for the dance floor. You get 9 tiles with the diameter of 1X1-feet for each tile. These interlocking tiles are suitable for tap dancing. The glossy urethane layer of the tiles makes them scuff and scratch-proof. This pack of 9 tiles includes the edge pieces. The thickness of each tile is ¾-inch. This dance floor has a robust polypropylene base. The tiles are waterproof and easily transportable. You can use this dance floor at school events and many other events. 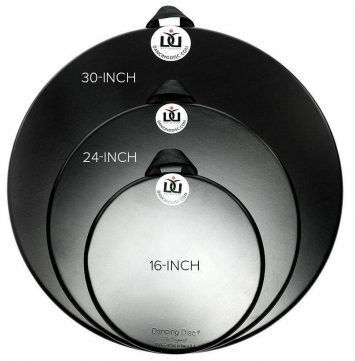 This round shaped dance floor comes with 30-inch, 24-inch and 16-inch size options. This dance floor is ideal for professional dancers. The dance disc is 1-inch thick. The bottom of this dancing floor comes with an anti-slip rubber layer. It comes with a built-in, sturdy 4-panel, seat belt handle for easy transportability. The disc is safe for hardwood floors. This is an ideal floor for tap dancing, Pointe work, and pirouettes. 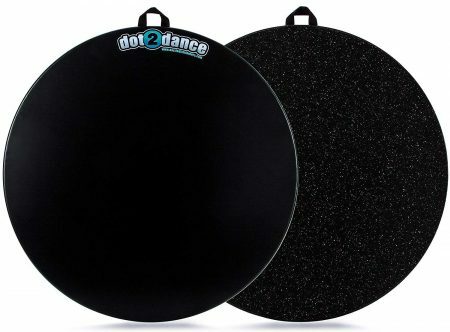 This dance disc is water-resistant and handcrafted in the USA. You can use this disc for dance competitions. The tile comes with the modular design with wood finish surface. Each of the tiles has the dimension of 12”X12”. You can get multiple color options on this tile. The tiles are perfect for garage and dance flooring. You can avail the finishing edge pieces with these tiles. The tiles are light in weight and easily transportable. The interlocking system of the tiles allows stress-free and no-tool installation and removal. Manufactured in the USA, these tiles have the thickness of ½-inch. The tiles can hold up to 25,000lbs. This handmade dance disc allows both side usage. From 16 to 48-inch, you can get 4 size options on this dance board. The 3/8-inch thickness and tapered edges provide safety with “traveling feet”. You get both the dance floor and gym mat on the same board. It comes with an inbuilt handle for easy transportability. This floor is suitable for all age groups with different skill levels. 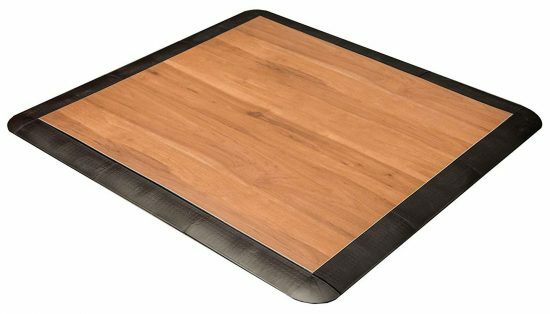 The board is all surface safe, and you can place it on the sand or grass with ease. This product features under Amazon’s Choice for the tap floor for dancing. Therefore, you can use the floor for regular rough use especially for tap dancing where there is a lot of friction. The product consists of one big 3×3 feet center tile and 12 edge tile. Besides, it is tailor-made to ease the impact that you might receive on your limbs and joints for tap dancing. The item is easy to assemble and disassemble, and there are multiple color options available. 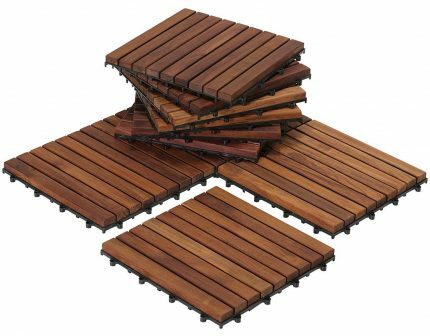 This is a 10 square feet portable dance floor, and it is made up of solid Teak wood. On top of that, it has an oil finish for durability and attractiveness. You can use the floor tile indoor as well as outdoors. The installation is very easy, and there are 10 tiles available, and they are inter-lockable. 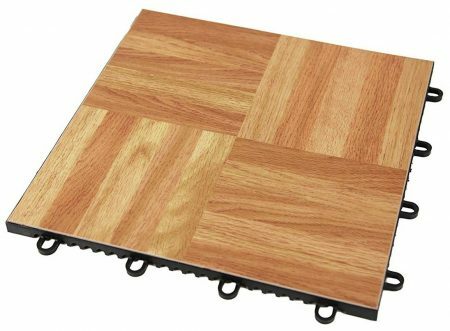 You can also install these tiles over uneven surfaces with ease without the need for any tool. Besides, removing and relating them is also convenient. 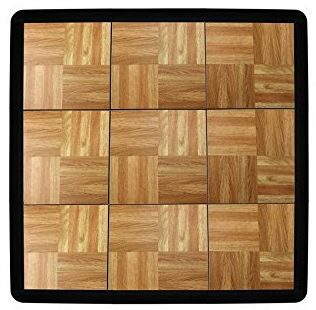 This set of portable dance floor tiles covers an area of 4×4 square feet, and there are 16 tiles available. If you need to cover smaller or larger area, you can select the pack of fewer or more number of tiles. There are various colors available to choose from. 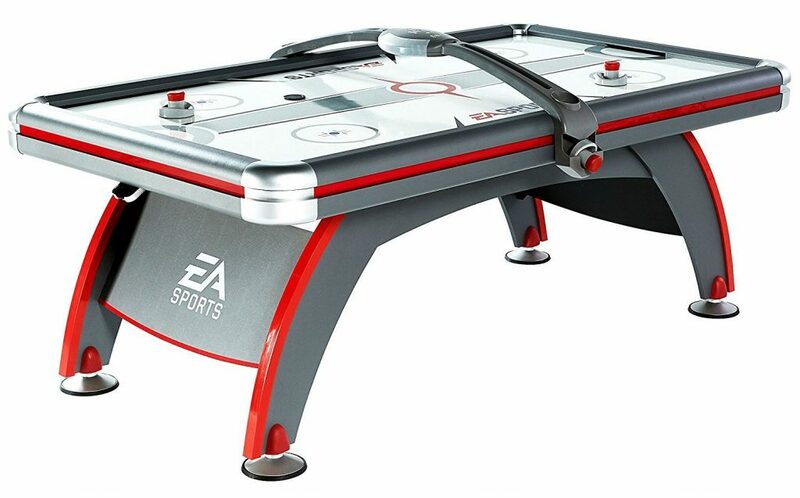 The product is light in weight and highly portable. They have toolless installation and perfect for both indoor and outdoor. The product is made in the USA, and it is highly durable. Depending on the area you want to cover, you can choose a bigger or smaller set. Besides, there are various color options available to make them look great with the room or outdoor décor you already have. The installation is very easy, and most of them can be interlocked and set up without any tools. You can use them on different occasions and when you call the guests for partying as dancing is a must at every social gathering.